Always believe something wonderful is about to happen! It was like a miracle that I got home and that stamp was sitting in my mailbox from Quietfire Design called Always Believe; pure serendipity. On the day I returned home I picked up the cold that was laying people out at CHA. I didn’t want it but at least I had the opportunity to visit, do and see everything I wanted to see in Arizona before it got me. I hate being ilde and sometimes we don’t know the reason why, but the last 5 days on the couch were a bit of a gift. I’ve recovered, and feel great now! I’m unpacking today and took a break to finish up a card started during the holidays – I didn’t know it at the time but it was just waiting for the right sentiment. I’m trying to continue to figure out new frame configurations using Spellbinders Graceful Frame Maker Tool. This is one using the Spellbinders Graceful Brackets border. 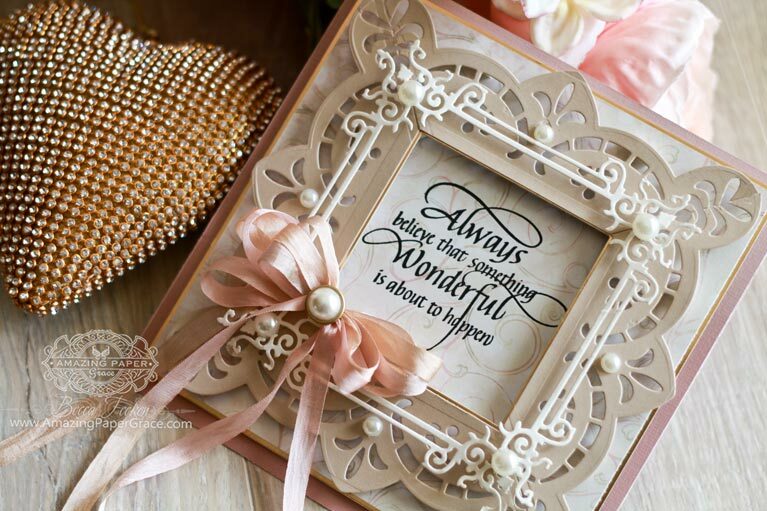 I also reached for Spellbinders (S4-478) Laced with Love as a wonderful accent for the frame. For new readers, every Friday it’s my pleasure to give away a card. The card goes to a randomly picked reader (worldwide) who leaves a comment in our conversation. Want to know more about Day of Giving, here’s a link to my FAQ’s just check out #11. I’ll be updating the list of winners this weekend so be sure to stop back by to check the list of winners HERE! For your comment: If something wonderful is about to happen, what do you hope it is? I hope you find something that makes you smile today. It’s a beautiful day and you belong smack dab in the middle of it! Hi Becca, Hope you are taking it easy! Rest up & enjoy a bit of a break. If something wonderful is going to happen soon I hope it’s more time to craft. I have been feeling a little down lately & crafting is my medicine. That I don’t get sick like everyone around me. What a beautiful card! I might have said that before??? Beautiful, gorgeous and inspirational use of dies. I love this card and sentiment. I hope you Get Well Soon, the dreaded bug is also over here in the U.K. If something wonderful were to happen I hope it is the cure for Cancer. It has blighted the lives of so many people. love your card, if something wonderful was about to happen I would like it to be……the biggest cliche around, Peace on Earth. Beautiful card Becca – and glad to hear you rested and gave your body time to recover from the cold. Such a very beautiful card again Becca, and a lovely verse.I hope you are now feeling better hun ?. I had no need to think about this one , my wonderful thing i want to happen is my son’s chemo treatment has worked, he has just 3 more treatments to go . As you can imagine it has been a very stressing time . But God Willing it will all be fine in the end. Hi Becca your card is beautiful and the sentiment is wonderful. Ever day is wonderful when I see my grandchildren smile our when they they? run too me to give Me a cuddle. This is a perfect card not only for you but for me too!!! Soooooo beautiful and encouraging! Sold the home I designed on 5 1/2 acres and shared with my husband until he slipped away to Heaven in October. Moving to a one-bedroom apartment at Capital Manor a few miles away in Salem, OR (this coming Tuesday). It would be WONDERFUL if I have downsized enough of my crafting to fit what I have packed to take with me into the apartment! The house contents were no problem, but the crafting has been a real challenge! God has been so gracious in keeping me busy and strong to make this journey! till you were home, as you did get to see the Grand Canyon ! is so uplifting to everyone. I truely have a blessed life and couldnt ask for a thing for myself so I hope that wonderful thing happens to my kids or for one of our many needy veterans in our country! I love the soft pink and beige color combination – lovely! There are so many people sick with colds and flu in my neck of the woods, too, it really makes one feel incredibly fortunate to be well. I’m glad you’re getting the rest you need.. I haven’t been happy in the employment realm for a long time, it would be so wonderful to have rewarding work with people that appreciate me. Thanks for the reminder, CAN HAPPEN!!! Something wonderful IS about to happen! Our city has brought back their “I Do” vow renewal service to our very own Venice Beach in Sarasota county Fl. Just in time for our 50th wedding anniversary! It will be on Valentines Day! I am over the moon to have such a beautiful service with all the other couples on this picturesque beach! Thank you for sharing your beautifully created and uplifting cards that make me smile every time I check them out! The colour combinations, ribbons, bling and words are perfect! If I could ask for one wonderful thing to happen, it would be acceptance… of others beliefs, ideas and in turn…. world peace. Just before Christmas a design team that I joined several years ago folded. Now we are about to launch a brand new card making blog where we have the freedom to creat anything as long as it fits a theme. I hope it goes well. your talent with us. I so appreciate you! Good morning Becca, fabulous card!!! fabulous sentiment!!! Oh Becca. Mi love the muted colored in this card. It really creates a great focus on the sentiment. Something wonderful would to be hearing that there has been a cure for cancer of all types. I am very fortunate that my great grandson is cancer free and hope that he stays that way. For my family every one to come to Jesus. Beautiful Card. 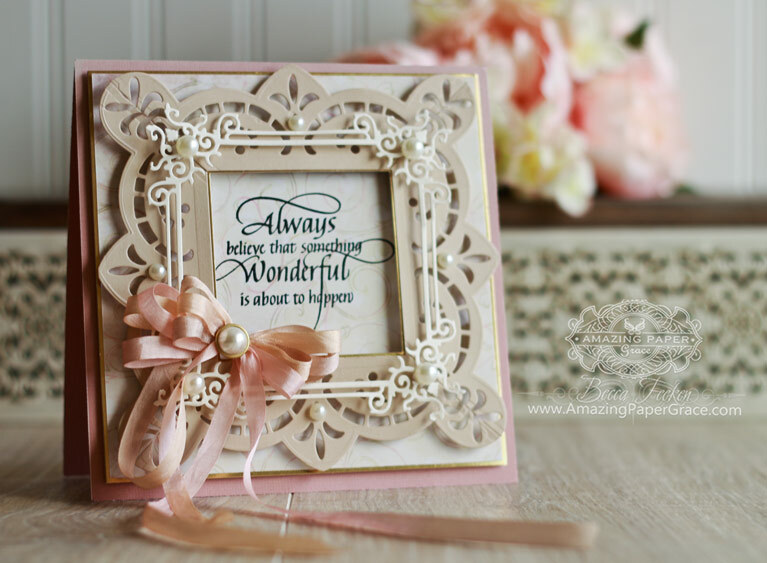 I love the sentiment and the lacy frame. 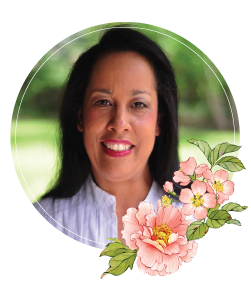 For my something wonderful –For myself and my husband to get well so we can go through with our Vow Renewal we have been working on since 2013. Everything is pretty much handmade by myself. This year is 13 years we have been through some really rough times with each of our families. Dear Becca.. it is such a gorgeous card.. as always loved it and hope that I get to receive this from you..
What a beautiful card Becca! I have that die, but never thought of putting it on top of another base die. Love the sentiment too! This is just such a fabulous card. You are using that wonderful frame maker and your cards are just absolutely gorgeous. Glad you are feelin better. Other than finding a cancer cure I would have to be selvfish and answer your question by saying “winning this card. Beautiful! You are so creative! If we all just made a daily effort to do one small deed a day based in kindness, wow that wow be wonderful. Wishing you a speedy recovery. Beautiful card Becca. as usual. everyone who has health problems will recover & feel great. I would wish for my body to heal. If something wonderful was about to happen I would love to spend 10 days with my boys and their families with no interruptions, truely family time! Beautiful card. Cant wait to see all the creative ways to use your graceful frame makers tool. My wonderful thing to happen would be that my dear friend and your friend would get a report that her medicine is working and she will be feeling much better soon. What a pretty card, Becca. I’m thankful you are feeling better from your bug and were able to post something today – I always love to see your work. What an awesome card here again Becca. I absolutely love that topdie and also this sentiment is amazing. If something wonderful were to happen to me… It would be that my hubby and my daughter would have clean bill of health, both have different worrying concerns at this time. Your card is stunning as all your creations are Becca, I don’t usually enter your give away cards as I am in England and I always feel its maybe more difficult for you…. if I won. My word! You even produce drop dead gorgeous cards from your sick bed!! I do hope you are feeling better now and am so glad that you managed to make it home before succumbing to the dreaded bug! So many wonderful things I could wish for, but top of the list would be peace for all people. Hi Becca, So sorry you haven’t been well, we have had a similar ‘bug’ over here in the UK too, thankfully you are feeling much better. Another stunning card, beautiful colours and gorgeous die-cuts and the sentiment is lovely. If something wonderful were to happen, I would wish for everyone to live in peace with each other. That our son finds a wonderful girl and marries. Sorry to hear you’ve been unwell Becca but glad you’re on the mend. Beautiful card you’ve given us the chance to win. Such pretty dies and your sentiment is beautiful. What a gorgeous card! Love the beautiful dies you used! You have done it again Becca sooooo beautiful !!! 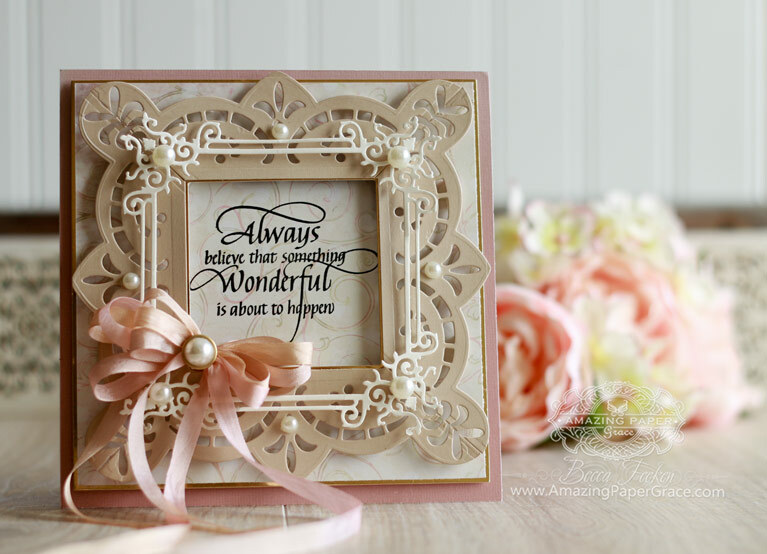 A beautiful use of your innovative frame maker dies. If something wonderful is about to happen I would love it to be a world wide declaration & promise to abolish hunger. In this day and age no one should be going hungry, especially babies and children. to use your frame and pocket dies on smaller cards. I so appreciate all the beautiful cards you create.